A few years after opening Liberty Rock Tavern in the Devon section of Milford, Chef Dan Kardos now has his sequel. A stone’s throw from Sikorsky—and 10 minutes from Liberty Rock—is Kardos’ new concept, Oar & Oak. 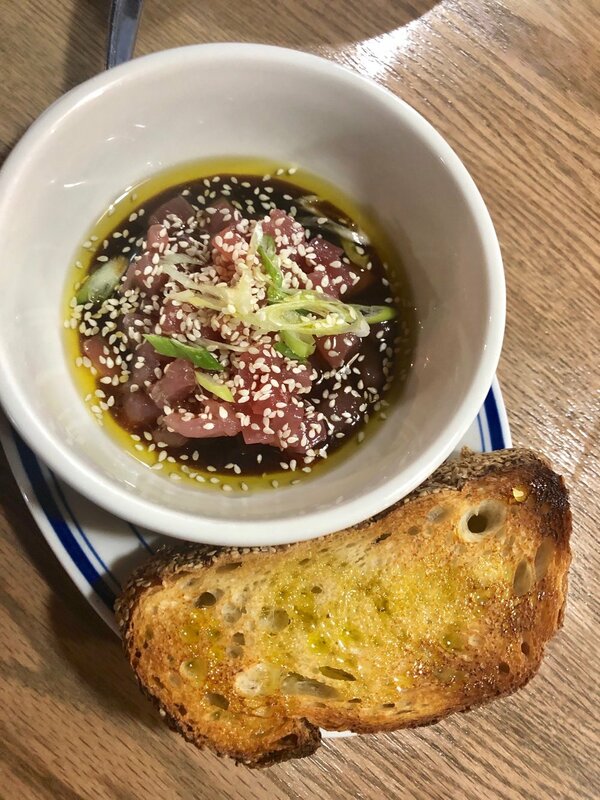 For Stratford residents, there’s that “Oh, yeah…” moment, but if you’re not from around there, the restaurant’s name is a play on words—it’s in Stratford’s Oronoque neighborhood. Much like Liberty Rock, Oar & Oak is very much focused on the area’s locals. “I want it to grow slowly, and become a neighborhood hangout,” Kardos said. “It used to be the original Parker Eatery—a favorite around here—so we freshened it up and gave it a new look.” The woodwork, brick walls, hanging lights, and periwinkle/grey/white tones in the space contribute to Oar & Oak’s casual, come-as-you-are vibe. It’s all unpretentious, and that includes Oar & Oak’s food and drink. Kardos’ idea here is a frequently changing menu (with a few staples) of American tapas and a handful of larger entrées at a reasonable price. That affordability is ever so evident at the bar. $10 cocktails in Fairfield County that are actually good?! I felt like a thief. I’ll admit, I was a bit iffy on ordering a tequila old fashioned on a Wednesday at noon, but it might’ve been the smoothest non-bourbon version I’ve had anywhere. Cocktails aside, expect a smattering of wines and a half dozen mostly local beers on tap from the likes of Aspetuck Brew Lab, New England Brewing Co., Tribus, Two Roads, and SingleCut. The grub at Oar & Oak is comprised mostly of small plates where you’ll see lots of creative roasted veggie dishes, fall-off-the-bone chipotle glazed pork ribs, addictive crispy potatoes with pancetta and lemon, and even Maine lobster mashed potatoes and gravy. That “something for everyone” includes something that sort of made the short trip from Liberty Rock Tavern…the fried chicken sandwich. Well, an iteration of it, anyway. It’s still crunchy on the outside, so juicy that it’s practically glistening on the inside. It’s still topped with B&B pickles and jalapeños, melted cheese, and bacon, but it gets a switch-up to a brioche bun instead of thick-cut toast, and the standard ranch dressing gets an infusion of smoky chipotle. There’s plenty more of “on-bread” choices like a bacon-mushroom-Swiss burger, crab & avocado toast, and creamy burrata on sourdough with sweet apple mostarda and toasted pumpkin seeds. If you’re looking for something more substantial, Oar & Oak does have larger offerings. Previous dishes in their brief past have been short rib stroganoff, chicken Milanese, and shrimp & grits with lobster gravy and ham. 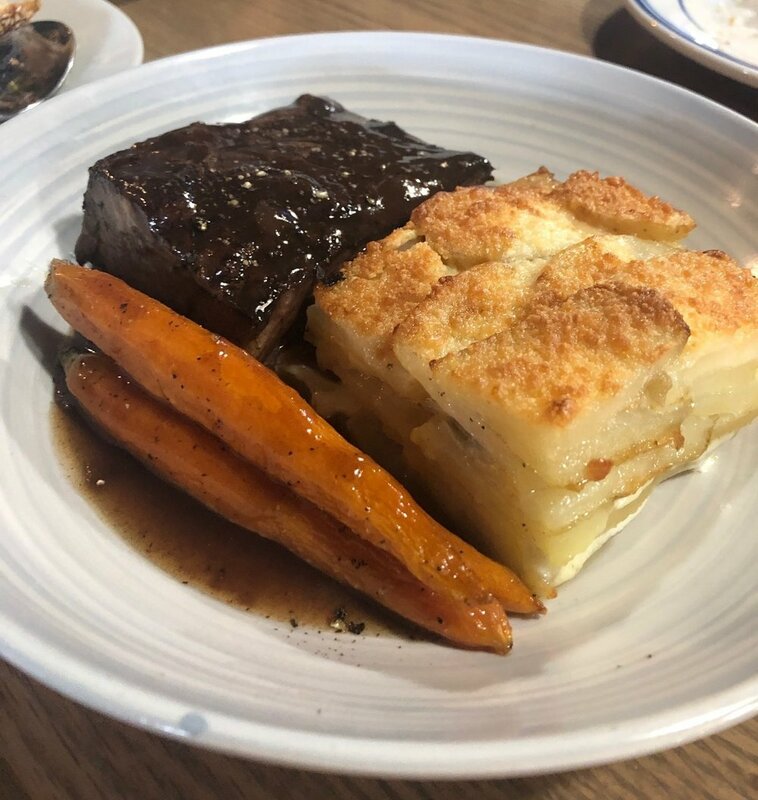 One that we tried—and absolutely crushed—was a braised, fork tender short rib with potatoes au gratin and roasted baby carrots. A perfect, hearty winter meal. Remember that whole price point thing from earlier? Yeah, so, you can roll in here on a weeknight, grab a few smalls, a drink, and escape for $25 - $30. Even a full out meal won’t break the bank. We think that’s pretty damn cool.